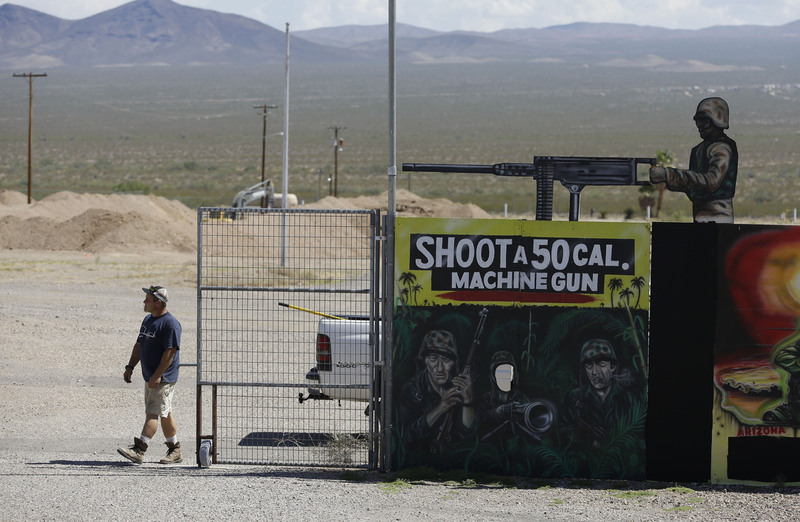 Fatal Shooting At Firing Range Sparks Debate About Safety : The Two-Way A firing-range instructor was killed by a 9-year-old who was being taught how to use an Uzi submachine gun. There are few regulations limiting children from participating at shooting ranges. A man closes off an entrance to the Last Stop shooting range in White Hills, Ariz., on Wednesday. Instructor Charles Vacca was killed at the range Monday by a 9-year-old girl he was teaching to use an Uzi submachine gun. A 9-year-old girl in Arizona on Monday accidentally killed her firing-range instructor when she lost control of an Uzi submachine gun. Is it common for kids to shoot guns at ranges? Adam Winkler, a professor of law at the University of California, Los Angeles, and the author of Gunfight: The Battle Over the Right to Bear Arms in America, says children are on the range all the time. One school of thought, which he subscribes to himself, he says, is that if children learn about the awesome power of guns, they will be less likely to play with them. Also, the thinking goes, what safer place to learn about guns than at a shooting range? Winkler says that what is rare to see is a child shooting an automatic weapon like an Uzi at one of these places. "To allow a 9-year-old to shoot a weapon like that is absurd," he says. "There's no reason that girl should have had that gun on her own." And he's not talking about ideology. An Uzi has a strong kick that a small girl could not physically hold down, he says. Are there regulations governing who can shoot at ranges? Winkler says that most states allow minors to possess guns when they are being supervised by adults. "I don't know of any state that bars minors from shooting guns," he says. The AP quotes Lindsey Zwicker, a staff attorney at the San Francisco-based Law Center to Prevent Gun Violence, saying that after a 2008 shooting in Massachusetts, Connecticut prohibited anyone younger than 16 from handling machine guns at shooting ranges. I asked Winkler if this latest incident could lead to changes in industry standards. "I would be surprised if the industry brings out new standards," Winkler says. "There is great hesitancy by the industry to adopt national rules or standards. They think this stuff is best left to individual judgment." What might happen, says Winkler, is that shooting ranges may change their policies to protect their instructors. How often do accidents like this happen? Winkler says that by and large, gun range accidents are rare. The New York Times spoke to the owner of Last Stop, where the accident happened. Sam Scarmardo said he would reconsider his policy of allowing children as young as 8 to participate. But he also touted the range's safety record. "In the last 14 years, we've probably had 100,000 people shoot five million rounds of ammunition, and of those, a thousand to two thousand of them were children," Scarmardo told the Times. "We've never given out a Band-Aid — no one's never even got a scratch." The AP reports that the last of these kinds of incidents in recent memory happened in 2008, when an "8-year-old Connecticut boy named Christopher Bizilj accidentally killed himself at a Massachusetts gun expo when he couldn't handle the recoil of an Uzi submachine gun similar to the one that killed [Charles] Vacca."